Carbon FibreThere are 14 products. Direct replacement for OEM part on Elise 111R, Exige S2 and Exige S onwards. Offers improved downforce compared with original part. Has little effect on the vehicle' s coefficient of drag. Carbon Fibre footwell divider for later models of Elise 111R, Exige S2 and 2-Eleven. Carbon fibre gearknob with brass insert and added weight for improved shifting feel. Designed for use with lift-up reverse mechanism on all Toyota engined Elise, Exige and 2-Eleven models. No-compromise ultra-lightweight carbon fibre gearknob with brass insert. 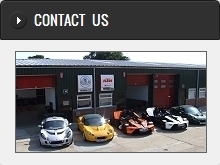 Designed for use with lift-up reverse mechanism on Toyota engined Elise, Exige and 2-Eleven models.